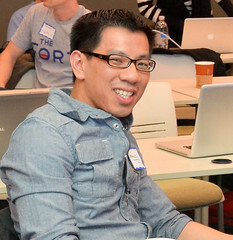 Francis Luong (AKA “Franco”) is a man in transition. He spent the last decade refining and improving the methodologies used to test IP/MPLS topologies and network elements by exploiting TCL/EXPECT as a means of automating the testing work flow. This made the method and output more consistent and detailed, and extended the workday beyond the usual 8-hours that a typical human being is present and attentive. He is now on a two week “rest” period before starting his next Network Engineering position with Juniper Networks. During this time, he expects to be busy as hell diving into the world of DC entrepreneurs, leaning about the problems they face and how he can contribute both in terms of technology, and in sheer terms of untangling logistical rats nests. He will get to see “bootstrapping” in action, and, hopefully, to do some of that himself. With any luck, he might find a glimmer of passion in the process.